Item #DB-2934: 19" necklace with 8mm round Hematite & Black Picasso Jasper, 10mm round Tree Agate & 12mm round Aquamarine beads, Nature's Paintbrush Jasper Sterling Silver pendant and Sterling Silver spring ring clasp. Sizes and shapes of pendants vary. 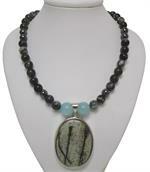 Item #MN-IGM-NPP-35: Sterling Silver Pendant with 1.5-2" oval Nature's Paintbrush Jasper Cab. Most have Gray or Tan backgrounds with scenes in assorted Cream, Tan, Brown, Pink, Yellow or Black. 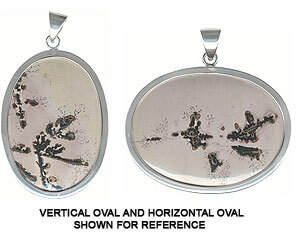 Item #MN-IGM-NPP-40: Sterling Silver Pendant with 1.75-2.5" oval Nature's Paintbrush Jasper Cab. Most have Gray or Tan backgrounds with scenes in assorted Cream, Tan, Brown, Pink, Yellow or Black. Item #AD-12AB-250: 19" long Necklace of 12mm round Aquamarine Beads; Sterling Silver spring ring clasp. Item #DB-2935: 19" necklace with 8mm & 10mm round Rhodonite, 8mm round Black Onyx & 12mm round Smoky Quartz beads with Nature's Paintbrush Jasper Sterling Silver pendant and Sterling Silver spring ring clasp. Sizes & shapes of pendants vary. Item #DB-2933: 19" necklace with 8mm round Autumn & Olive Jasper and 10mm round Black Onyx beads with Nature's Paintbrush Jasper pendant in Sterling Silver and Sterling Silver spring ring clasp. Sizes & shapes of pendants vary. Item #DB-2955: 19" necklace with 8mm round Hematite, Black Picasso Jasper & Moss Agate beads, 12mm round Aquamarine beads, Nature's Paintbrush Jasper pendant in Sterling Silver and Sterling Silver lobster claw clasp. Size and shape of pendant varies. Item: #IGM-PCT-32: 30"-32" Continuous strand necklace of 8mm round Picture Jasper Beads. Item: #IGM-RDJ-32: 30"- 32" Continuous strand necklace of 8mm round Red Jasper Beads. 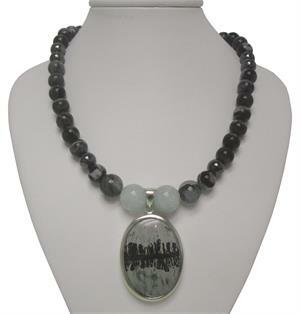 Item #IGM-BPJ-32: 30"-32" continuous 8mm round Black Picasso Jasper Bead Necklace. 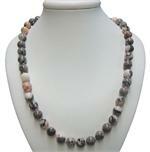 Item #IGM-ZEB-32: 30"-32" continuous 8mm round Pink Zebra Jasper Bead Necklace. 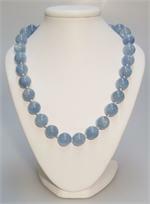 Item #IGM-HEM-32: 32" continuous 8mm round Hematite bead necklace. 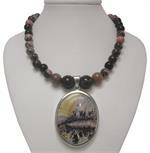 Item #IGM-AJ-32: 32" continuous 8mm round Autumn Jasper Bead Necklace. Item #IGM-POP-32: 32" continuous 8mm round Poppy Jasper Bead Necklace. Item #MN-IGM-NPP-12: 1.25"-1.75" in length Sterling Silver Pendant with assorted sizes of oval and round Nature's Paintbrush Jasper Cab. Most have Gray or Tan backgrounds with scenes in assorted Cream, Tan, Brown, Pink, Yellow or Black. Item #NPJ-30: Sterling Silver pendant with 1.25"-2" Nature's Paintbrush Jasper cab.Most have Gray or Tan backgrounds with scenes in assorted Cream, Tan, Brown, Pink, Yellow or Black. Shapes and sizes vary.